ASIO, spol. s r.o. was established in 1993 as a Czech engineering supplies company with international operations. 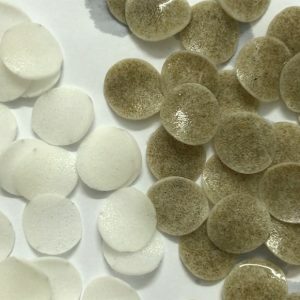 The company is involved in the development, production, and delivery of technologies for wastewater treatment, water treatment and air treatment. The wide range of water management products that it offers are employed in the treatment of wastewater from family houses, villages, towns, hospitals, and in various branches of industry. ASIO, spol. s r.o. is a Czech company represented in 32 countries, through a wide network of subsidiaries and representatives. Besides its quality production base, it has built a network of sales and service centres not only in the Czech Republic, but also in a number of European countries. 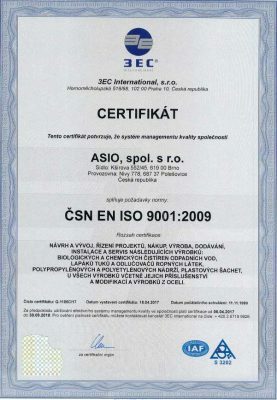 All these closely cooperating companies are associated in the ASIO Group, where the quality of sales and production is certified in the Quality Assurance System, in accordance with the ISO 9001:2009 a ISO 14001:2005. standards. In the development sphere, it cooperates with many academic institutions and universities, such as civil engineering and chemical technology universities. ASIO, spol. s r.o. and its employees are members of various professional and sectoral associations (e.g., Czech Water Association – CzWA, Association of Manufacturers of Thermoplastic Structures – AVKT, Technical Standardization Commissions at UNMZ, etc.) that are involved in the preparation and amendment of Czech as well as European legislation. 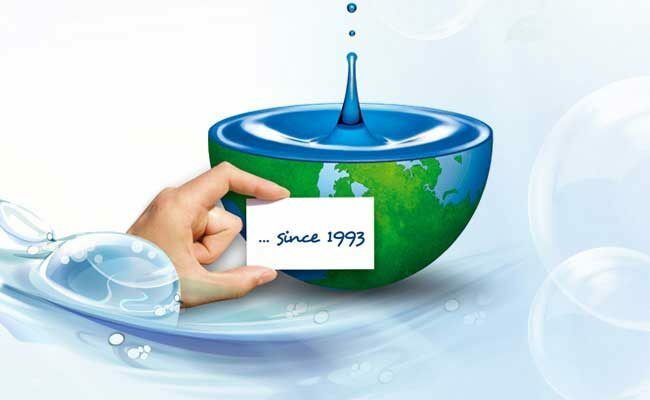 The aim of the company is to provide comprehensive supplier services in the sphere of wastewater treatment, water treatment, and air treatment, offer modern, high-quality and reliable products complying with the requirements of European legislation; observe high environmental standards; and meet the customers’ requirements for “easy, quick, top-quality, and environmentally friendly” services. 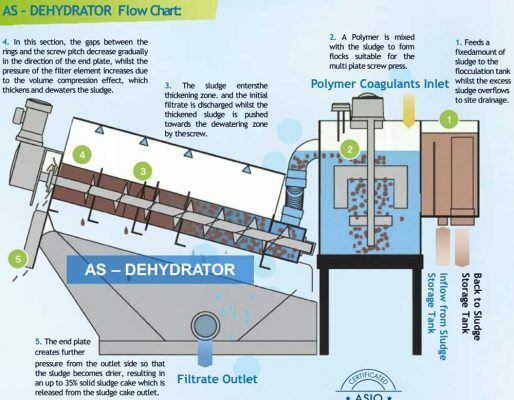 The spiral dehydrator is used for the thickening and subsequent dewatering of sludge. The equipment is small and lightweight and can work in automatic operation with minimal maintenance requirements. The device guarantees the thickening of activated sludge to at least 18% of dry matter, for sludge from municipal WWTPs. The device is produced in several lines, and thanks to its low investment as well as operating costs, it is suitable mainly for industrial treatment plants and municipal treatment plants from 1,000 to 10,000 PE. 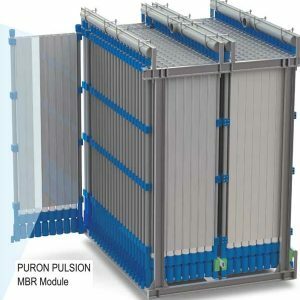 Another great benefit of this device is the ability to thicken secondary sludge directly from the activation, which may eliminate the cost of the construction of storage tanks within the design of a new WWTP. The dehydrator contains a thickening zone that eliminates the need of thickening the sludge before its inflow into the device. The dehydration drum forms a compact structure together with supplementary devices that allows you to minimize spatial requirements. The dehydrator is designed in such a way that it is protected from clogging. 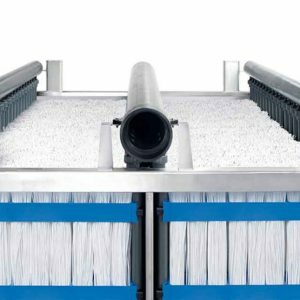 This minimizes the requirements for rinsing water and operation. The energy consumption of the dehydrator is very low (0.3 – 2.15 kW). 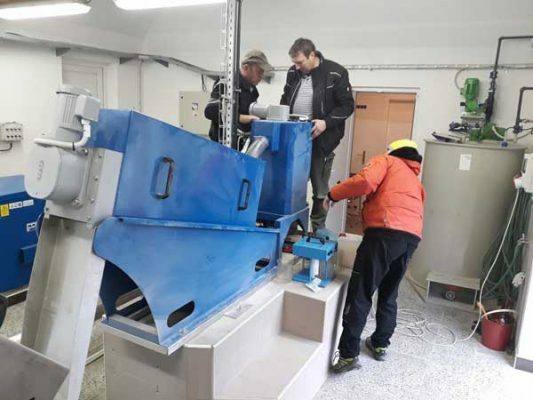 The device dehydrates sludge with low dry matter concentration directly from the activation part and produces a sludge cake with the dry matter content of about 20 – 25%. The dehydrator is able to work in continuous automatic mode, incl. dosing of chemicals. The time requirements for its maintenance and operation are minimal (approx. 5 min/day). The dehydration drum consists of a volute rotating at a constant speed under a layer of fixed and movable lamellas. The volute pushes the edges of the movable lamellas that continuously move in the gaps between the fixed lamellas during the rotation of the volute. In this way the space inside is cleaned, thus preventing clogging. Sludge water is then drained through the gaps between the lamellas. The gaps between the lamellas get gradually smaller towards the place where the sludge cake is removed. The gap between the lamellas is first 0.5 mm in the thickening zone, 0.3 mm in the dewatering zone, and at the end the gap is 0.15 mm. The end compression plate increases pressure onto the sludge cake to achieve more efficient sludge dewatering. Sludge is pumped to the operation tank with a sludge pump. To ensure a constant supply quantity of sludge, the operation tank contains a manually adjustable overflow from which sludge is routed back to the storage tank of thickened sludge. Flocculant is dosed into the flocculation part of the operation tank and flocculated sludge is drained to the spiral of the dehydration drum. 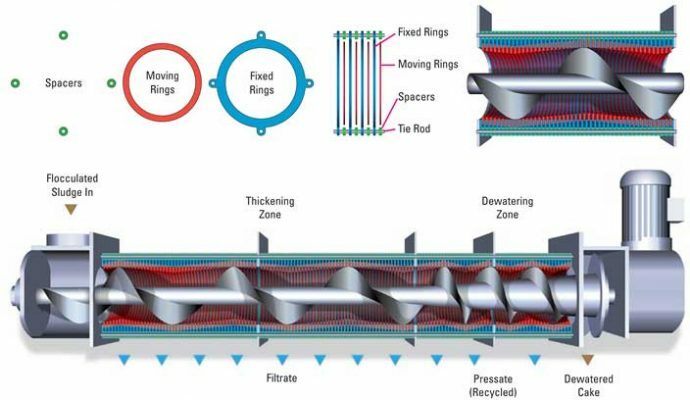 Sludge routed into the dehydration drum is concentrated by means of gravity in the concentration zone and further moved to the dewatering zone with the use of the volute.